The polycrystalline silicon is melted in a fused silica crucible heated by an induction heated graphite suceptor. The graphite heater may alternately be directly driven by a low voltage at high current. 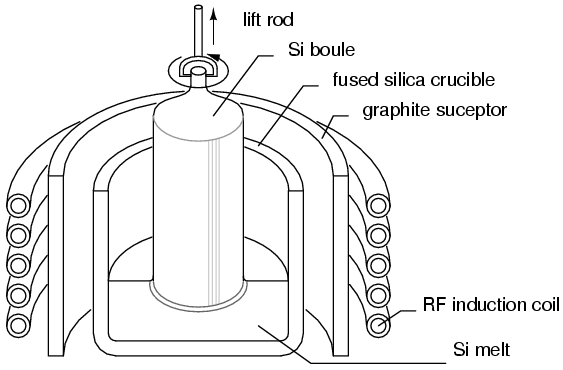 In the Czochralski process, the silicon melt is solidified on to a pencil sized monocrystal silicon rod of the desired crystal lattice orientation. (Figure below) The rod is rotated and pulled upward at a rate to encourage the diameter to expand to several inches. 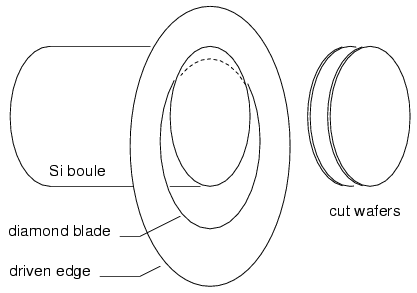 Once this diameter is attained, the boule is automatically pulled at a rate to maintain a constant diameter to a length of a few feet. Dopants may be added to the crucible melt to create, for example, a P-type semiconductor. The growing apparatus is enclosed within an inert atmosphere. The processing of semiconductors involves photo lithography, a process for making metal lithographic printing plates by acid etching. The electronics based version of this is the processing of copper printed circuit boards. This is reviewed in Figure below as an easy introduction to the photo lithography involved in semiconductor processing. We start with a copper foil laminated to an epoxy fiberglass board in Figure above (a). We also need positive artwork with black lines corresponding to the copper wiring lines and pads that are to remain on the finished board. Positive artwork is required because positive acting resist is used. Though, negative resist is available for both circuit boards and semiconductor processing. At (b) the liquid positive photo resist is applied to the copper face of the printed circuit board (PCB). It is allowed to dry and may be baked in an oven. The artwork may be a plastic film positive reproduction of the original artwork scaled to the required size. The artwork is placed in contact with the circuit board under a glass plate at (c). The board is exposed to ultraviolet light (d) to form a latent image of softened photo resist. The artwork is removed (e) and the softened resist washed away by an alkaline solution (f). The rinsed and dried (baked) circuit board has a hardened resist image atop the copper lines and pads that are to remain after etching. The board is immersed in the etchant (g) to remove copper not protected by hardened resist. The etched board is rinsed and the resist removed by a solvent. An N-type doped silicon wafer in Figure below (a) is the starting material in the manufacture of semiconductor junctions. A silicon dioxide layer (b) is grown atop the wafer in the presence of oxygen or water vapor at high temperature (over 1000o C in a diffusion furnace. A pool of resist is applied to the center of the cooled wafer, then spun in a vacuum chuck to evenly distribute the resist. 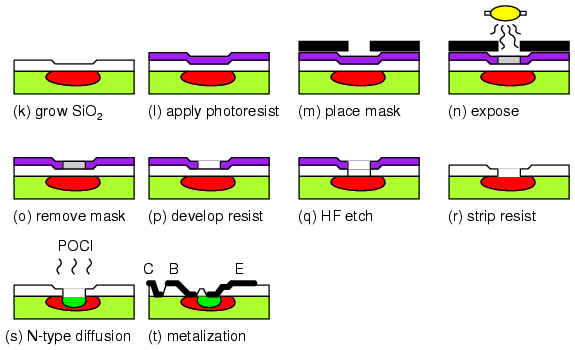 The baked on resist (c) has a chrome on glass mask applied to the wafer at (d). This mask contains a pattern of windows which is exposed to ultraviolet light (e). After the mask is removed in Figure above (f), the positive resist can be developed (g) in an alkaline solution, opening windows in the UV softened resist. The purpose of the resist is to protect the silicon dioxide from the hydrofluoric acid etch (h), leaving only open windows corresponding to the mask openings. The remaining resist (i) is stripped from the wafer before returning to the diffusion furnace. The wafer is exposed to a gaseous P-type dopant at high temperature in a diffusion furnace (j). The dopant only diffuses into the silicon through the openings in the silicon dioxide layer. Each P-diffusion through an opening produces a PN junction. If diodes were the desired product, the wafer would be diamond scribed and broken into individual diode chips. However, the whole wafer may be processed further into bipolar junction transistors. After the unexposed resist is stripped from the wafer (r), it is placed in a diffusion furnace (Figure above (s) for high temperature processing. An N-type gaseous dopant, such phosphorus oxychloride (POCl) diffuses through the small emitter window in the oxide (s). This creates NPN layers corresponding to the emitter, base, and collector of a BJT. It is important that the N-type emitter not be driven all the way through the P-type base, shorting the emitter and collector. The base region between the emitter and collector also needs to be thin so that the transistor has a useful β. Otherwise, a thick base region could form a pair of diodes rather than a transistor. At (t) metalization is shown making contact with the transistor regions. This requires a repeat of the previous steps (not shown here) with a mask for contact openings through the oxide. Another repeat with another mask defines the metalization pattern atop the oxide and contacting the transistor regions through the openings. Most semiconductor are based on ultra pure silicon because it forms a glass oxide atop the wafer. This oxide can be patterned with photo lithography, making complex integrated circuits possible. Sausage shaped single crystals of silicon are grown by the Czochralski process, These are diamond sawed into wafers. The patterning of silicon wafers by photo lithography is similar to patterning copper printed circuit boards. 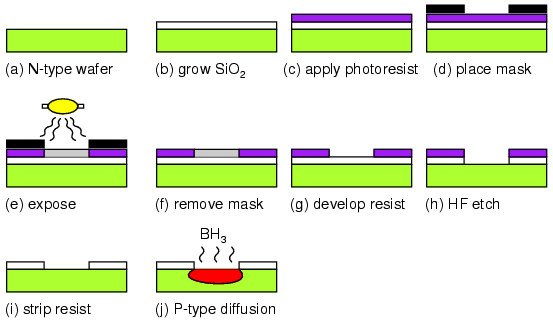 Photo resist is applied to the wafer, which is exposed to UV light through a mask. The resist is developed, then the wafer is etched. hydrofluoric acid etching opens windows in the protective silicon dioxide atop the wafer. Exposure to gaseous dopants at high temperature produces semiconductor junctions as defined by the openings in the silicon dioxide layer. The photo lithography is repeated for more diffusions, contacts, and metalization. The metalization may interconnect multiple components into an integrated circuit.